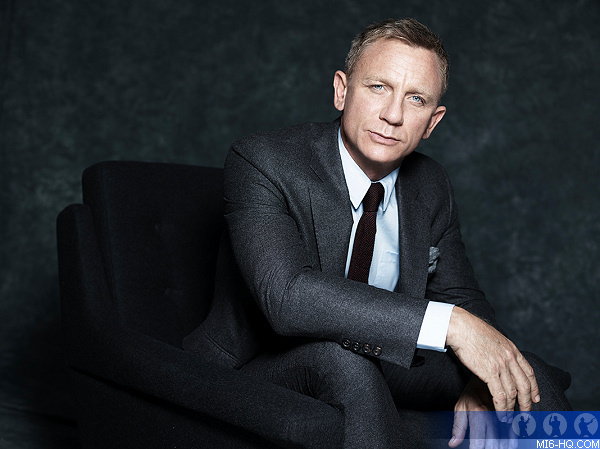 Daniel Craig confirmed on 'The Late Show with Stephen Colbert' tonight that he will be returning to the role of 007 for the 25th James Bond film. It will also be his last. "I've been quite cagey about it. I've been doing interviews all day and people have been asking me and I think I've been rather coy but, I kind of felt like if I'm going to speak the truth I should speak the truth to you..."
Colbert joked that "we could use some good news here" and asked straight out "Daniel Craig, will you return as James Bond?" "Yes," Craig responded flatly and created an instant roar from the audience. "I couldn't be happier," he beamed through the cheers. "I have to apologize to all the people I did interviews with today... But I wanted to tell you." "It's been a couple of months," Craig said when asked how long he has known that he would come back. "We've been discussing it... We've just been trying to figure things out. I always wanted to. I needed a break." Colbert then brought up the infamous "slash my wrists" line from an interview he gave whilst wrapping up the brutal SPECTRE shooting schedule. "Look, there's no point making excuses about it, but it was two days after I finished shooting the last movie and I went straight into an interview and somebody said 'would you do another one' and I went 'nooooo'. Instead of saying something with style and grace, I gave a really stupid answer." The New York Times reported back in July that Craig had a verbal agreement with producers that he would return for Bond 25. That timeline was confirmed tonight. "Is this the last Bond? Can you tell me if you're going to do the one after that?" Colbert asked at the end of the interview. "I think this is it. This is it," Craig replied. "I just want to go out on a high note. I can't wait." Daniel Craig will become the longest serving James Bond actor when Bond 25 is released in cinemas. On the day of the US release, he will have been 007 for 5,139+ days, pipping the late Sir Roger Moore's 5,118 days in the role.